November 2018 www.coalage.com 17 autonomous haulage systems continued the original partnership. "We have been working on this for a long time," Cook said. Throughout the testing period, Komatsu began field vali- dation in the early 2000s before the first commercial deploy- ment with Codelco in Chile in 2007. In 2008, another system was launched with Rio Tinto at a Western Australia iron ore mining operation. "Using those two deployments, we began to learn more about the systems," Yureskes said. "That's when more specific applica- tion development began, which led to the first North American deployment with Suncor Energy in 2016." Similar to traditional open-pit mines, the foundation of a strong autonomous platform is the mine plan. The inputs and the production requirements are the basis for the system design. One of the biggest advantages for Komatsu is the Dispatch FMS and integrating it with its FrontRunner system to issue assignments to the trucks through a central control unit. "One of the misconceptions about autonomous mining is that it's a relatively simple bolt-on remote-control system," Yure- skes said. "That's not the case. The true benefit of the system is the integration of all these systems together." Different Levels of Autonomy When Yureskes talked about autonomy, he explained that there is a spectrum of technologies that range from manned operations to complete artificial intelligence. "Right now, we fall right in the middle of this spectrum as far as trucks operating without drivers," Yureskes said. 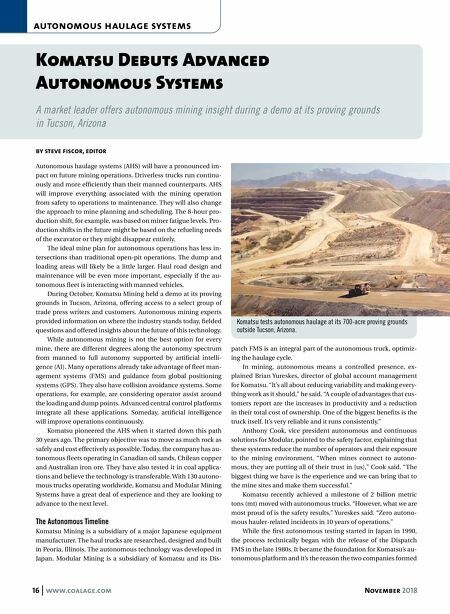 "Not only do we offer multiple solutions for autono- mous technologies, some of those will be integrated into mine sites based on the needs of that mine site — a customized solution." The Komatsu AHS has five components: the autonomous haul trucks, the loading equipment, equipped manned vehicles, Front- Runner central control, and the wireless communications network. Acting as the brains of the operation, FrontRunner issues assign- ments and acts as a supervisory system for the entire operation. The benefits of this system are improved safety, precision and repeatability, and efficiency. All of which will drive productivity increases and help keep costs low. "The precision, as in where the materials are placed, limits re-handle and improves haulage cycle times," Yureskes said. "The performance is repeatable and pre- dictable, which keeps mine planning and budgeting consistent and improves the overall efficiency at the mine site." He also cited several possible ancillary benefits depending on the operation, such as lower fuel consumption, increased tire life and reduced maintenance costs. These result from the truck run- ning within the design envelope with no human variability as far as how the truck is operated. 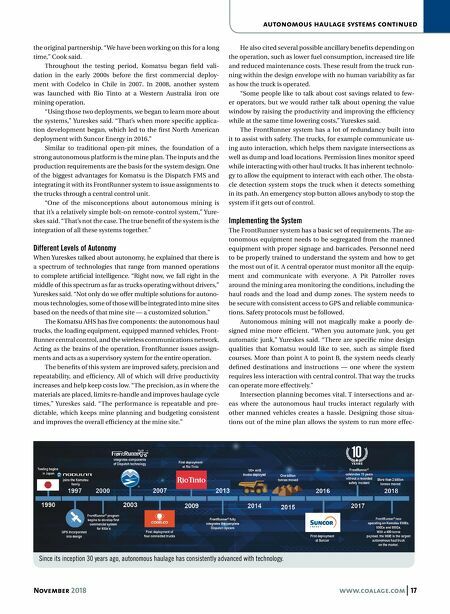 "Some people like to talk about cost savings related to few- er operators, but we would rather talk about opening the value window by raising the productivity and improving the efficiency while at the same time lowering costs," Yureskes said. The FrontRunner system has a lot of redundancy built into it to assist with safety. The trucks, for example communicate us- ing auto interaction, which helps them navigate intersections as well as dump and load locations. Permission lines monitor speed while interacting with other haul trucks. It has inherent technolo- gy to allow the equipment to interact with each other. The obsta- cle detection system stops the truck when it detects something in its path. An emergency stop button allows anybody to stop the system if it gets out of control. Implementing the System The FrontRunner system has a basic set of requirements. The au- tonomous equipment needs to be segregated from the manned equipment with proper signage and barricades. Personnel need to be properly trained to understand the system and how to get the most out of it. A central operator must monitor all the equip- ment and communicate with everyone. A Pit Patroller roves around the mining area monitoring the conditions, including the haul roads and the load and dump zones. The system needs to be secure with consistent access to GPS and reliable communica- tions. Safety protocols must be followed. Autonomous mining will not magically make a poorly de- signed mine more efficient. "When you automate junk, you get automatic junk," Yureskes said. "There are specific mine design qualities that Komatsu would like to see, such as simple fixed courses. More than point A to point B, the system needs clearly defined destinations and instructions — one where the system requires less interaction with central control. That way the trucks can operate more effectively." Intersection planning becomes vital. T intersections and ar- eas where the autonomous haul trucks interact regularly with other manned vehicles creates a hassle. Designing those situa- tions out of the mine plan allows the system to run more effec- Since its inception 30 years ago, autonomous haulage has consistently advanced with technology.